Sock has a long way to go. Tennys looks like he will be right where he was before the AO if he doesn't defend points. Amazing he couldn't grab some more points with all the opportunities that came last year. Alright gang, my fantasy tennis draft is this coming saturday. Help me make my draft list. 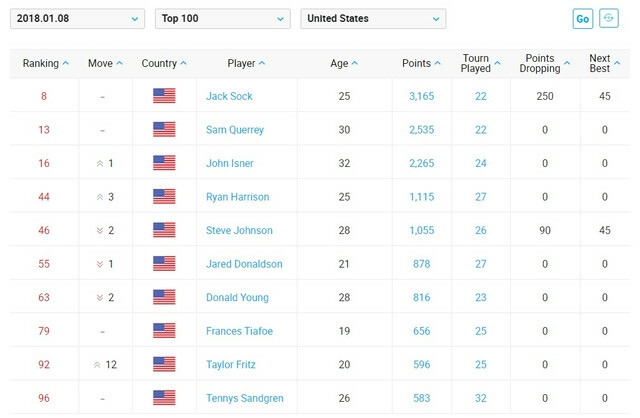 The criteria is straightforward: Number of ATP points -- or legal tender notes...either works -- earned over the "Big 13" tournaments (4 majors + 9 masters). Starts to get kinda tricky after that. I'm both worried about ranking Fed too high and too low. He's already, in my estimation, shown himself to be a player on the decline, and I don't envision any late late late career resurgences this time. Father Time is undefeated, as they say. And on top of that, he voluntarily leaves 5,000 ATP points on the table in the name of "rest" (::cough:: avoiding Rafa :cough:). I actually think Delpo would be a solid 4 if he was healthy (he withdrew from Oz, but has been practicing). Is Andy Murray damaged goods at this point? (I think so). Okay, and since we actually are probably only going to have 5 teams in the league this season, with 9 players on each squad, I'll probabl just stop there and you all can thank me later for the bonus pick. 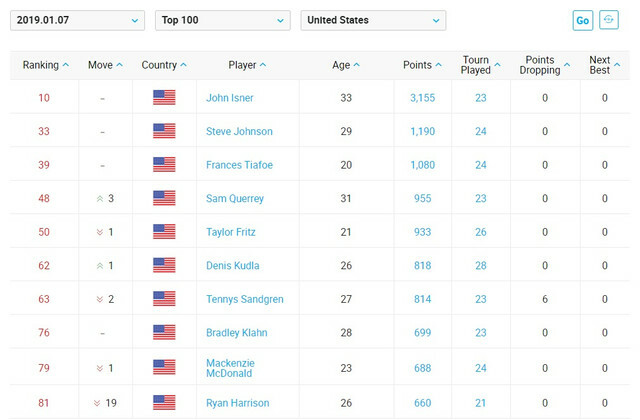 Also, I really do need to emphasize that I just compiled that not completely off the top of my head, but very quickly with only the aid of a few glances at the ATP rankings. In other words, I not only reserve the right to edit the above-ordered list, I but I 100% will be doing so. And this is where y'all can help a man out. Where do you think my list is a little off? Where do you think it's WAY off? Where do you think it's a list that could have only been compiled by a full-blown ruhtard? Okay, maybe don't be quite that harsh, but your opinions are earnestly solicited. Anyway....I can't disagree with you. He did manage to make a nice run in Houston, and fwiw, he's still alive in Auckland, but those 360 points are looming large. Let's be super optimistic and assume he gets to the third round and picks up 90 points. That's a dropoff of 270, which would put him back at #102 as the rankings currently stand. So, yeah, basically what you said. If he could get into the 4th round, he'll still be in GS direct entry range. But in all likelihood, he won't get into the 4th round. But not on account of me not rooting for him. Go Tennys. Go Vols. Down with SJWs! *It's so easy...I just can't help myself. "sure, I"ll bang ya....how does right now sound?" that's a very telling thing to say. it's impossible to take this guy seriously. Tennys might have used the break wisely, just took down Checcinato! How do these exhibition matches really work? They both just get a check for showing up? Tennys into the Auckland semis. Wide open now, all the seeds are out. 4 Americans into the last round of qualifying of AO. ETA: "kinda bored kinda lonely DM me", she says. Love it. What a dirty wheeuuuure. Tennys into the final. Destroyed Kohlschreiber. He'll likely get Cameron Norrie, who is up 3-0 against Struff right now in third set. Go Tennys. Get dem points. ETA: he does indeed get Norrie in the final. They play at 6pm EST. No odds posted yet that I can find, but seems like Tennys would be slightly favored. Either way, it's a winnable match and those 250 ATP points would be massive. ETA2: He's at 50 in the live rankings. His career high is 47. A win would put him at 41. ETA3: the only odds I could find on the internet have Norrie as a very slight favorite. Alright, so the commish (my brother), caved into pressure from no-talent chumps and decided to change the format. We are only drafting 4 players each. So depending on whether one guy decides to play this year, we will either draft 16 or 20 players. Help me tighten up my top 20. Come on, your input is earnestly solicited. Tennys wins Auckland for his first career title. Tennys made himself a BUNCH of money this week. Looks to move to #40 to start the AO.